Building off another impressive year of growth, area businesses are expanding their investments in new projects around northern Illinois and southern Wisconsin. Get the scoop on what’s new in our region and what’s to come in the year ahead. The Ironworks Campus on Beloit’s riverfront continues to welcome new businesses, including a career development center and a golfing entertainment space. A new pedestrian bridge connects the campus with the eastern riverbank. If 2017 seemed like a good year for business growth around our area, then prepare for more of the same. Economic development experts around the region believe we’re on an upward trend that will continue during the coming months. Businesses big and small are stretching their wings in every corner of northern Illinois and southern Wisconsin. In some cases, these businesses are growing where they are, and in others they’re reaching out to new territories. This economic confidence is no mirage – indeed, job opportunities are arising, and new projects are being planned at a rapid-fire rate. The housing and manufacturing sectors are making a comeback, and municipalities are investing in the infrastructure so necessary for continued growth. We caught up with the major economic development organizations in five locations around our region to see what sort of business growth they’re experiencing, and to gauge what’s coming in the year ahead. 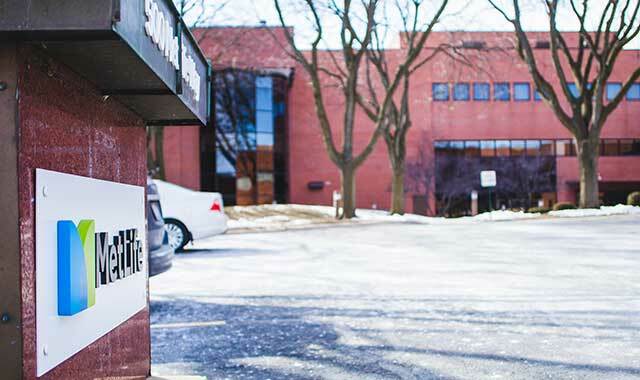 Business and job growth continues to flourish around three key sectors of Beloit: The Gateway Business Park, Ironworks Campus downtown and Beloit College. The newest arrival to the city’s Gateway Business Park is the G5 Brewing Co., which is expected to open in the summer of 2019. Slated to be the only microbrewery in the Beloit area, G5 expects to offer a full-service bar and restaurant with outdoor seating available. Located at the confluence of Interstates 39/90 and 43, Gateway Business Park is home to at least nine companies with products that include office supplies, nuclear medicine support, food flavorings, and industrial hardware. Gateway remains a key target for business attraction, says Andrew Janke, executive director of the Greater Beloit Economic Development Corporation. The pace of growth continues to be strong in Beloit’s downtown district, where several projects have helped to enhance the Ironworks Campus along the Rock River. Last year, crews finished up a pedestrian bridge across the Rock River that now links the east and west sides of downtown Beloit. It’s been a big year for Ironworks, where several new businesses have popped up in recent months. The Stateline YMCA now operates on property donated by businesswoman Diane Hendricks, whose Hendricks Commercial Properties manages Ironworks. The massive facility has also become the home of Hendricks CareerTek, a community partnership that provides career development and educational opportunities for local youth. Ironworks has also welcomed a new golf lab that boasts entertainment space, an HD simulator that enables play in 14 sports – including golf – and Wisconsin’s only affiliation with the Golf Channel Academy. Just across the river, the area around Beloit College is undergoing rapid improvements. After a fundraising goal of $38 million was met, work has begun on the Powerhouse Project, which aims to redevelop the former Alliant Energy power plant into the college’s new campus activity center. Construction on the 130,000-square-foot building is well underway, with a grand opening planned for 2019. Just to the south of campus, Hendricks Commercial Properties has begun construction on its new Hotel Goodwin, at 500 Pleasant St. The former WP&L building is being converted into a 34-room boutique hotel that’s expected to offer a restaurant and premier rooftop meeting space for receptions and private events. The $5 million project is scheduled to open this summer. All over Beloit, Janke is seeing strong signals of a rebounding housing market. Construction is already beginning on several new residential developments, including Willowick Assisted Living, the Hawk’s Ridge Apartment complex, Kadlac Condos and the Eagles Ridge subdivision. Belvidere’s economy charged ahead last year, as an estimated 2,200 new jobs arrived across all sectors, according to Pamela Lopez-Fettes, executive director for Growth Dimensions, the city’s economic development group. The city’s banner year is due in large part to a $350 million retooling at Belvidere’s Fiat Chrysler Automobiles (FCA). As it’s begun producing a redesigned Jeep Cherokee, the plant has added about 300 new jobs, giving FCA more than 5,000 area workers, says Lopez-Fettes. The FCA retooling brought the arrival of two sizeable businesses to Boone County: Magna Exteriors, which produces vehicle exteriors, and Yanfeng, which manufactures instrument door panels and consoles. New hires across the automotive sector have contributed to the region’s positive jobs numbers. Yanfeng’s new 336,000-square-foot building has added another 550 new jobs to the Belvidere area, with an investment around $36 million, says Lopez-Fettes. 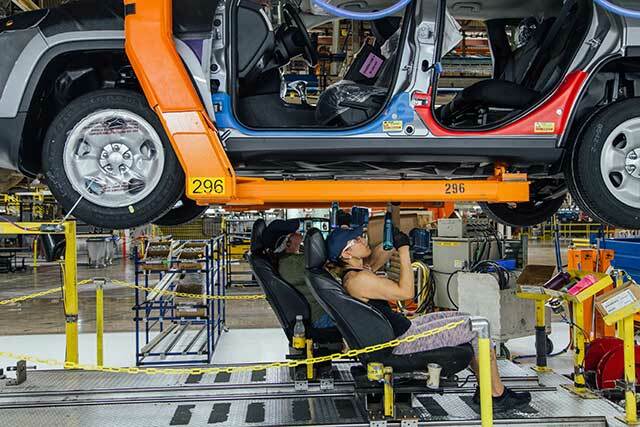 Between new hires at FCA and its suppliers, all related to the introduction of the Jeep Cherokee, Boone County’s workforce has grown by close to 900 jobs, she adds. Outside the automotive sector, the city’s seen new investment in food service, child care, entertainment and gas stations, among other areas. Downtown is getting a big boost this year as an architectural firm moves forward on its plans to occupy the former Post Office on South State Street. Ollman Ernest Martin Architects recently bought the 107-year-old structure, which is listed on the National Register of Historic Places, and plans to update the space while keeping its historical and architectural significance intact. Current plans call for the building’s lobby to be used for meeting space or special events. Work is expected to be complete this spring. Lopez-Fettes believes Belvidere’s proximity to major highways, Rockford and Chicago has played a big role in the city’s latest development and will continue to play a role in business attraction efforts. 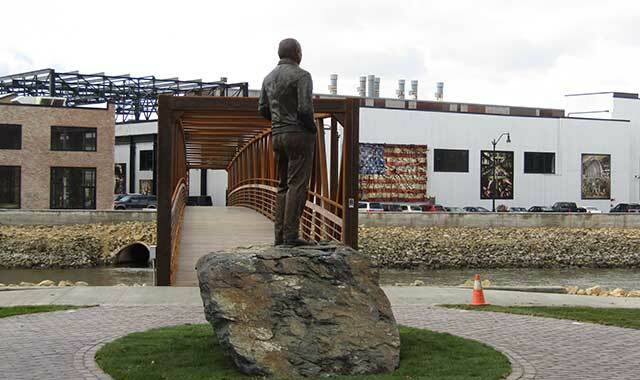 After leaving town in 2014, the MetLife insurance company is returning to downtown Freeport. The national insurance giant has brought 200 workers to its modernized offices, with plans to bring an additional 450 more in the next two years. Growth and development in both the residential housing and commercial sectors have bolstered Freeport’s economy over the past year. Last year, the city saw two new family homes being built, marking Freeport’s first housing starts since 2008. Two new senior housing projects – Parkview Estates and WinnPrairie – also have been completed. To keep the momentum going, city officials have created a special housing enterprise zone that targets the Rose Ridge/Rose Meadows and Rye Ridge subdivisions on Freeport’s far west side. This enterprise zone creates financial incentives for builders and buyers of new homes, in the form of exemptions, abatements and lower fees. An additional 14 to 15 homes are planned for these two neighborhoods, says city manager Lowell Crow. At the same time, the city has waived residential building fees for subcontractors, so that only the general contractors, and not the sub-contractors, have to be registered for building permits with the City, Crow adds. Outside of housing, other parts of Freeport’s economy are growing. Manufacturers including Modern Plating, Tri-Star Metals, Snack King and Sauer-Danfoss have recently completed building expansions. Downtown Freeport has welcomed two new restaurants: 312 Beef & Sausage and Pub 219, which specializes in draft beer and pub foods. The MetLife Auto and Home office downtown is enjoying a new life with the return of its former tenant. The insurance giant left Freeport in 2014 but returned last May, bringing 200 workers to the firm’s renovated, modernized office space on West Stephenson Street. Crow says the MetLife Center for Training plans to bring 450 more jobs to Freeport within the next two years. Crow believes even more progress is possible in Freeport’s future, given its recent shift to a city manager model of government. In the coming year, look for new networking opportunities between the city and the business community, including a potential merger between local entities that oversee economic development. Major investments in the healthcare and aerospace industries are leading the way in Rockford’s latest wave of growth. All three area hospitals have committed to major expansions, none so large as the new Mercyhealth Hospital and Trauma Center going up on East Riverside Boulevard at Interstate 90. The $505 million project is expected to be one of the largest construction ventures in Rockford’s history, and it’s expected to generate more than 1,000 construction jobs and 400 permanent healthcare positions when it opens early next year. Once it’s complete, the new hospital will include the highest-level trauma center, a state-of-the-art women’s and children’s hospital, the highest-level perinatal and neonatal intensive care units and a wide variety of subspecialty services. A grand opening is set for January 2019. 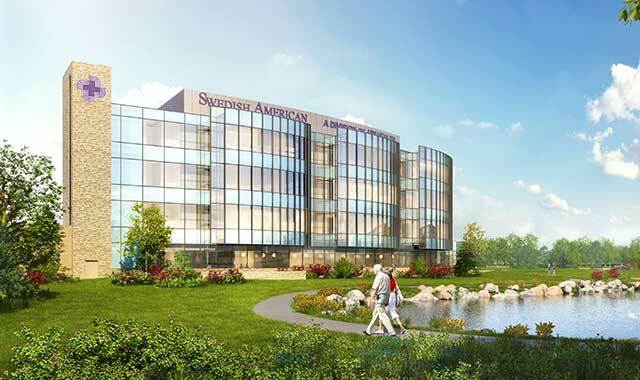 SwedishAmerican, a division of UW Health, also has plans to expand its presence in Rockford, starting with a proposed $130 million new tower and facility improvements at its Midtown campus, which will include services for women and children. Elsewhere in the city, SwedishAmerican is constructing three new clinics. Work is expected to begin this spring on Creekside Medical Center, a $24 million facility on Bell School Road in northeast Rockford. The 70,000-square-foot clinic will offer internal medicine, family practice, OB/GYN, pediatrics and endocrinology services. Creekside will also offer medical imaging and lab services. A grand opening is planned for next spring. Construction has already begun on the Riverwest Clinic, located on Marchesano Drive, in southeast Rockford. Expected to open this fall, the clinic will offer obstetrics, primary care, lab and imaging services. The Edgewater Medical Center, an $11.5 million clinic, will be located on North Main Street in northwest Rockford and will include 16 medical providers and 60 patient rooms within 40,000 square feet. About 600 construction jobs will be involved with the three clinics, and dozens of permanent jobs will arrive once the facilities open, according to SwedishAmerican. OSF Saint Anthony Medical Center has also opened an $85 million, four-story tower with private rooms, a women’s health center, a kitchen demonstration area, and expanded pharmacy services, among other amenities. While healthcare is leading the way, it’s not the only source of good news for the region. The Rockford area’s aerospace industry continues to gain lift, especially as AAR’s new maintenance, repair and overhaul facility wins new business at the airport. A continuing partnership between AAR and Rock Valley College (RVC) is helping to supply some of the workforce needed for AAR to reach its expected peak of 500 jobs. Students studying at RVC’s airplane maintenance technology center, across the street from AAR, have an opportunity to interview with the company upon graduation. Nathan Bryant, president and CEO of Rockford Area Economic and Development Council, believes this unique partnership provides a useful model for other industries that want to build a pipeline of talent. New businesses continue to appear in downtown Rockford, where several big projects are already underway. Most notable among them is the beginning phases of the proposed Embassy Suites hotel and conference center at the former Amerock/Ziock building on the river. Crews are also working on the preliminary stages of a new indoor City Market on Madison Street as well as the demolition, environmental remediation and rebuilding of the Rockford Public Library’s main branch on Wyman Street. Downtown Dixon, Ill., remains a vibrant commercial district where vacant spaces generally fill up quickly, says Mayor Liandro Arellano. 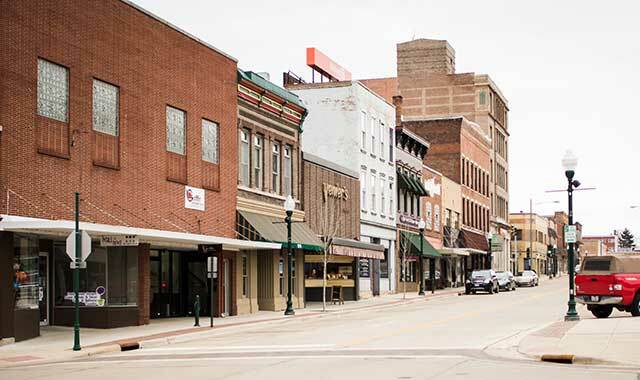 Infrastructure improvements are leading the way in Dixon, Ill., as the city continues on a path toward improving commerce and quality of life. Dixon Mayor Liandro Arellano estimates more than $5 million will be spent on citywide street resurfacing over the next two years, in an investment he believes will help new and existing businesses to generate growth. One area of focus for economic growth is the Interstate 88 corridor. Arellano says another industrial park is planned and the city is looking at ways to expand retail. Small business continues growing in downtown Dixon, which is quickly filling up. In just the past year, the area has welcomed new food shops, a clothing boutique and a medical services business. “Our downtown retail business development has exploded to the point that we are having a hard time finding square footage for new businesses,” Arellano says. Changes in the banking world have allowed Midland States Bank to consolidate its brick-and-mortar operations to the upper floors of its North Galena Avenue building. The landmark building has been purchased by KSB Hospital, which now uses the first floor for its billing and professional services. Arellano is also encouraged by new commercial development in niche corridors around Dixon, including Depot Avenue. Looking toward the future, Arellano would like to see more residential housing development, the creation of a new industrial park and continuing efforts downtown. This entry was posted on Tuesday, April 3rd, 2018 at 12:00 pm	and is filed under Northwest Business Magazine, Top Posts. You can follow any responses to this entry through the RSS 2.0 feed. Both comments and pings are currently closed.